For the second research project a new, extended test track was commissioned in Groß Dölln, Germany. It is tailored to mirror real operating conditions. Siemens will install a catenary system for hybrid trucks in Sweden. The contract was awarded by the Swedish Transport Administration to the County Council of Gävleborg. The catenary system will electrify a two-kilometer stretch of the E16 highway north of Stockholm in the context of a demonstration project. The test results will be available two years from the start of the demonstration phase and are intended to demonstrate the system’s suitability for future commercial use. Sweden has set ambitious climate targets - the aim is to develop a fossil fuel independent transport sector by 2030. The core of the system is an intelligent pantograph combined with a hybrid drive system. A sensor system enables the pantograph to hook up to the catenary system and disconnect automatically at speeds of up to 90 km/h. 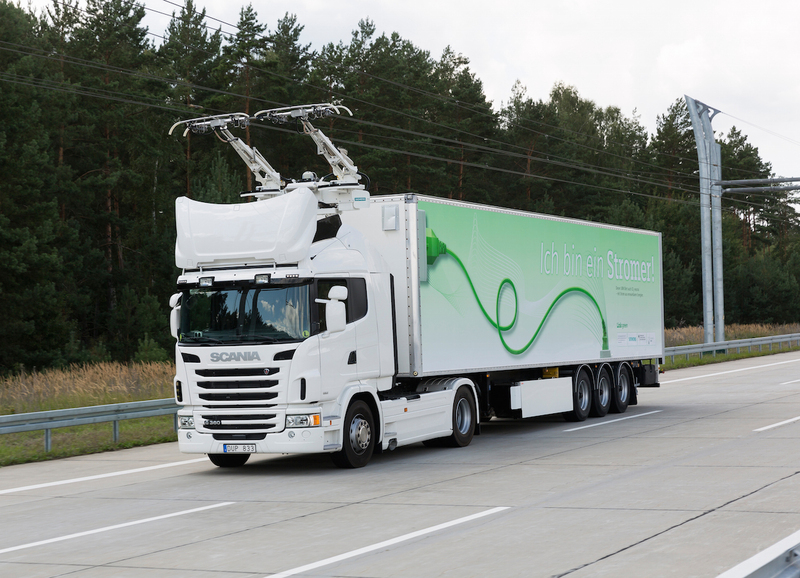 Trucks equipped with the system draw power from the overhead catenary wires as they drive, enabling them to travel efficiently and with zero local emissions. On roads without any catenary infrastructure, the vehicles in Sweden can make use of their diesel hybrid system. As an alternative, the system can run, for example, on compressed natural gas or a battery. The demonstration project will be conducted on the E16 which connects the regions of Dalarna and Gävleborg, industrial regions dominated by steel, pulp and paper, and mining industries, with the port of Gävle. Two vehicles will be used in the demonstration phase. These are electric hybrid trucks manufactured by Scania and adapted, in collaboration with Siemens, to operate under the catenary system. In California, Siemens is working with vehicle manufacturer Volvo and local truck retrofitters on a demonstration project for the South Coast Air Quality Management District (SCAQMD). This project is testing how different truck configurations interact with the eHighway infrastructure set up in the vicinity of the ports of Los Angeles and Long Beach. Siemens AG (Berlin and Munich) is a global technology powerhouse that has stood for engineering excellence, innovation, quality, reliability and internationality for more than 165 years. The company is active in more than 200 countries, focusing on the areas of electrification, automation and digitalization. One of the world’s largest producers of energy-efficient, resource-saving technologies, Siemens is No. 1 in offshore wind turbine construction, a leading supplier of combined cycle turbines for power generation, a major provider of power transmission solutions and a pioneer in infrastructure solutions as well as automation, drive and software solutions for industry. The company is also a leading provider of medical imaging equipment – such as computed tomography and magnetic resonance imaging systems – and a leader in laboratory diagnostics as well as clinical IT. In fiscal 2014, which ended on September 30, 2014, Siemens generated revenue from continuing operations of €71.9 billion and net income of €5.5 billion. At the end of September 2014, the company had around 343,000 employees worldwide on a continuing basis. Further information is available on the Internet at www.siemens.com.